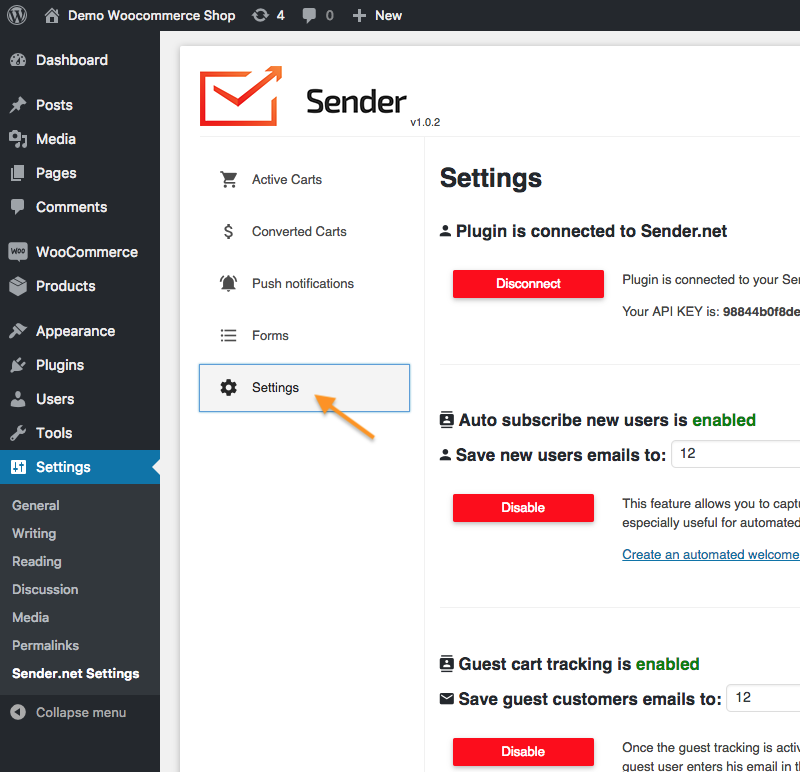 This is the official documentation for Sender.net’s WordPress / WooCommerce v1.0.5 integration plugin. This plugin doesn’t require WooCommerce to be installed, you can use it as a separate product. However, to use most of the features, it’s necessary to have Woocommerce installed. Then head to the ‘Settings’ menu. You will find most settings there. They are described and explained in the following sections of the documentation. This feature allows you to capture new users automatically and add them to the selected subscriber list. It is especially useful for automated welcome emails. Select a Sender.net subscriber list into which the new user emails will be saved. The feature is enabled by default. To stop the ‘Auto subscribe new users’ click on the the ‘Disable’ button. Once the ‘Guest cart tracking’ is activated – all guest carts will be tracked and will show up in the dashboard. In basic terms, that means that if the guest user enters his email in the checkout form, the email will be automatically captured even if the guest did not click the button ‘Submit information’. This is especially useful if you’re using the one-step checkout. Select a Sender.net’s Mailing list to which guest user emails will be saved. The feature is disabled by default.To start ‘Guest cart tracking’ click on the ‘Enable’ button. This feature uses different WooCommerce cart tracking methods(so-called hooks) which might slow down your page. It allows you to track carts more accurately. Usually, the cart is updated only once in awhile, this feature updates the cart when the user clicks on something, therefore increasing the accuracy. The feature is enabled by default. To disable ‘High Accuracy Mode’ click on the ‘Disable’ button. If you are experiencing any slowdowns, please disable this option. 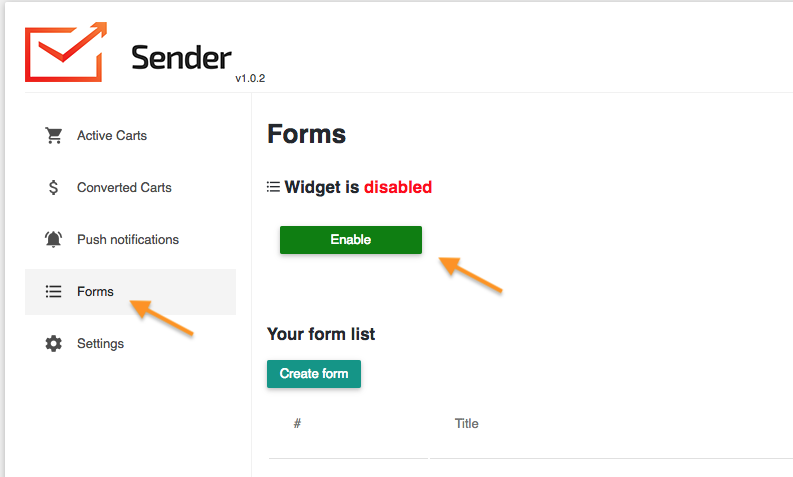 This feature allows you to easily import product blocks into the Sender.net’s email creator. All you need to do is to copy the product’s link and the system will automatically import the product to your email. The feature is enabled by default. To disable it click on the the ‘Disable’ button. In order for people to subscribe to your push notifications, they have to click on your Push notifications icon and agree to receiving notifications. This feature adds the Push notifications icon to your website. You can manage the push campaigns in your Sender.net account’s dashboard. 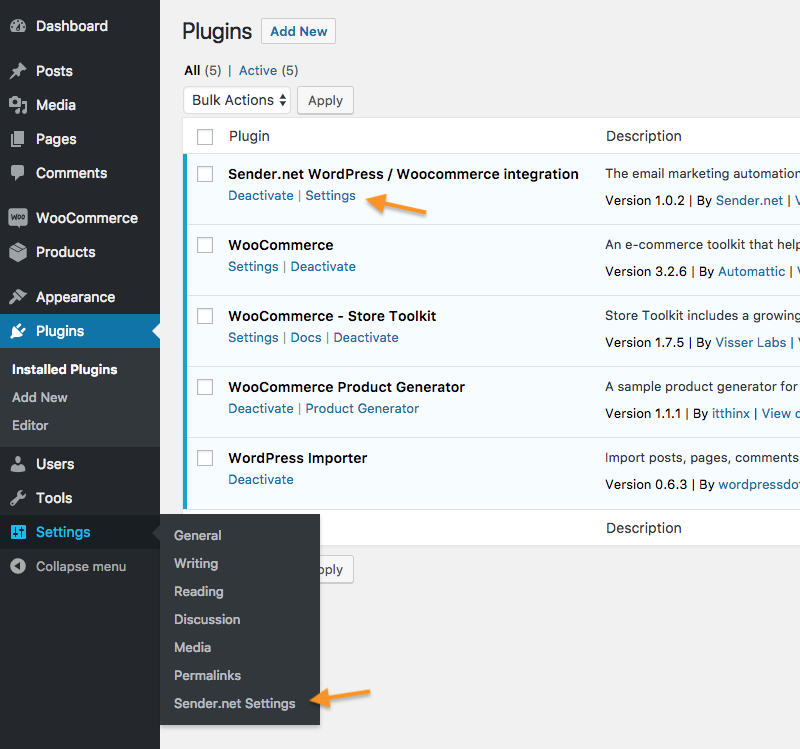 NOTE: These features are only available if the WooCommerce Plugin is installed and enabled. In this section you can see the current active and abandoned carts. The carts have two states : active or abandoned. If the customer’s email was captured, the plugin will start an Abandoned Cart Event which can trigger your Sender.net’s automation, i.e., an Abandoned Cart Reminder to remind the customers about the precious items they abandoned and help you make more sales. The cart is considered abandoned if the user takes no action for 15 minutes. In this section you can see all the carts that have been converted successfully. The ‘Recovered’ column shows you whether the cart was recovered via Sender.net’s Abandoned cart reminder email – if the user receives an email mentioning his abandoned cart and then completes the purchase, the cart will be marked as ‘Recovered’.